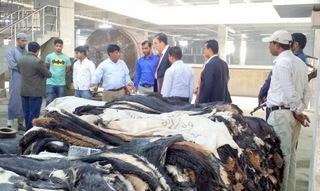 Bangladesh Tanners Association (BTA) > Latest News > Visit by the European Union (EU) Delegation to the Savar Tannery Estates. A Delegation of the European Union (EU) headed by Mr. Konstantinos Vardakis, Minister Counselor visited Savar Tannery Estate on 16 February, 2017. The Delegation was received by the representative of the Bangladesh Tanners Association. Mr Sanjoy Kumar Thakur (Consultant, BTA) and Officials of BSCIC. 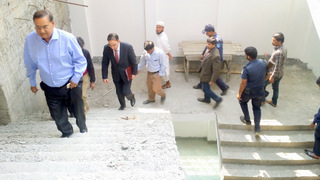 The delegation went round the Appex Tannery, Fancy Leather Enterprise and Samota Leather Complex Ltd. Mr. Shamsul Huda (Hudu) welcome the delegation at his Fancy Leather Enterprise while visiting his industry. 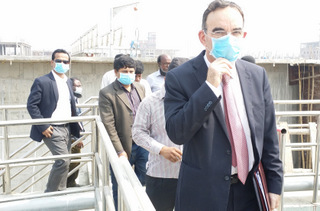 Later the delegation went round the CETP areas were the delegation was briefed by the Project Director.